As an individualist and Computer Scientist, I couldn't bear to simply use Wordpress and adapt it to my purpose, especially since I already have a perfectly good (and very colourful) pre-existing web journal, Hype Dark. The website is a simple PHP, MySQL and CSS site. All posts are read from the Hype Dark database but filtered for the Geek On a Bicycle tag. The CSS used to provide the theme for this website is an adapted version of the K2 theme for Wordpress. Under the terms of the GNU GPL, I am required to provide the source for any derivative work - this can be found here. The photo gallery uses the Picasa Web API in PHP (this is incorporated into Zend's framwork as Zend_Gdata. I used the Slimbox2 script to display images. I prefer Picasa Web to Flickr as a repository for photos outside of Facebook since it is relatively painless to upload and browse photos. Originally. to allow location updates while on the road (and without internet access), we made use of Twitter's ability to accept SMS messages since running our own SMS gateway would have proven too costly. Twitter on the other hand accepts tweets sent from a registered mobile phone free of charge. The plan was to use local sim cards to text messages to Twitter's long code number. This didn't work at all and I ended up texting my friend manually who would post them to Twitter for me. In order to determine my location, I used a dedicated GPS unit - a Garmin ETrek Vista HCx, a basic rugged navigation unit with mapping capability. The device has a cold start acquisition time of around 40 seconds, and a theoretical battery life of 25 hours which was enough to acquire coordinates for quite a few weeks before running out of charge! These coordinates were then direct messaged to a dedicated Twitter account. 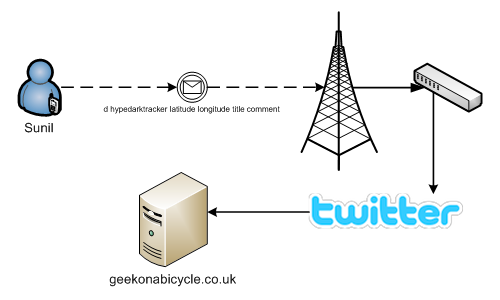 Direct messages are collected from Twitter via a PHP script, executed daily by a cron job. The script uses the terribly incomplete php-twitter wrapper class which has been modified so that it actually works for direct messaging! Source available here. Statistics are collected manually because the best alternative solution would be to use Daytum but that lacks the ability to embed graphs in external websites. Instead, a MySQL database is used to collect statistics, coupled with the Google Charts API to display the data. Statistics are texted to Twitter and then scraped in the same way as for location.